Brad Paisley Shares New Single, "Bucked Off"
The country picker will perform the song at the CMA Awards on Wednesday. 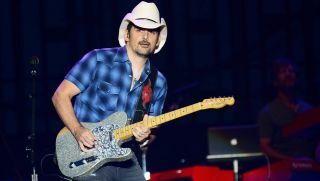 Brad Paisley has shared a new single, “Bucked Off,” which he describes as “turbo honky-tonk, reminiscent of ‘80s and ‘90s country but futuristic.” You can check out the song below. Paisley co-wrote "Bucked Off" with frequent collaborators Chris DuBois and Kelley Lovelace, and contributes a characteristic snappy guitar solo. The song was co-produced by Dann Huff and Paisley, and Kendal Marcy executive produced. Paisley will be performing the new single at the 52nd Annual CMA Awards on Wednesday, and will also serve as co-host alongside Carrie Underwood. For more information, head over to BradPaisley.com.